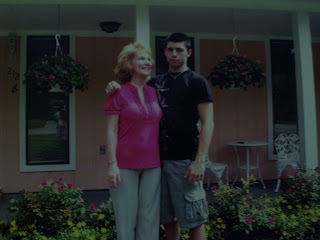 This picture was suppose to go with my post of my grandma for her birthday. It downloaded but it didn't show up on the post. 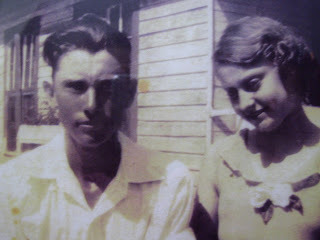 This is Mamaw and Papaw Mann when they were dating. They were married about a month after this picture was taken and were married for over 60 years. They had seven children. 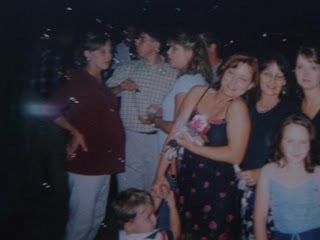 Aunt Shelby, Aunt Martha Ann, Aunt Jenny, Uncle Danny, My daddy(Bobby), Uncle Greg, and Uncle Joey. Two of their children are already in Heaven with my PaPaw. Don't they look so sweet together? She reminds me of Ashley Judd in this picture. My favorite actress. 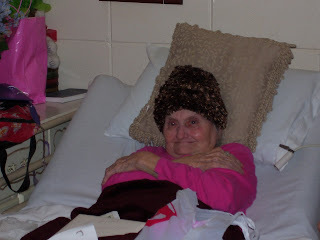 November 19th was my grandma's 88th birthday. Isn't she so pretty? 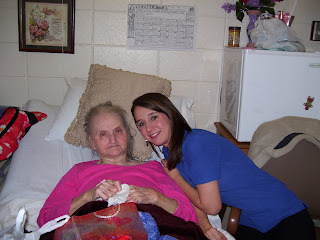 We went to see her at the nursing home for her birthday. 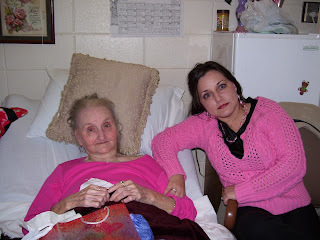 Can you believe that she and I both had on pink? We didn't even plan it. She didn't know that we were coming. My daughter and I had both been at work and it was 7:30 p.m. before we even got to go and see her. She is a night owl too. I guess that is where we got it from! I do all my best cleaning and decorating at night. She had told daddy that she wanted a hat to keep her head warm. Look what he bought her! We laughed and laughed! She did look cute in it. Look at her posing! This was four generations of us! 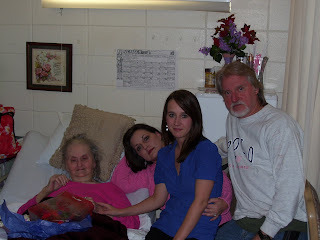 Mamaw,Me,Christy,and my daddy. We would have had five generations but it was too cold to get Christy's baby out. We will have to do that next time. Yesterday, we spent all day at the hospital in Hattiesburg. 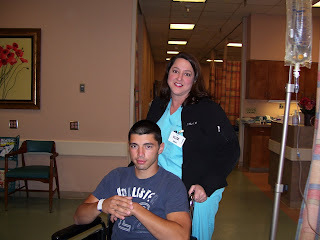 My son had to have outpatient surgery. 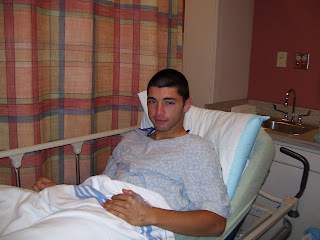 He had a cyst in his neck that appeared to be getting larger and the doctor recommended taking it out and having it checked to make sure that is wasn't anything bad. He thinks its just a fibroid. They will send it off to the lab and have it tested. Cole gets to stay home on his Thanksgiving pass until Sunday. I'm gonna bake him his favorite...pumkin pie. He eats a whole one by himself. 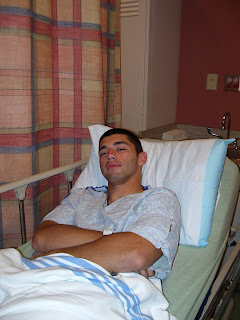 His surgery went well and he is doing fine. He was really emotional afterwards when the medicine was wearing off. He told me that he loved me over and over again. I'm so glad that it all went well and that it is over. 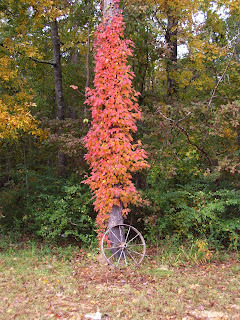 Isn't this tree with the vine growing up it pretty? I don't know what kind of vine it is. I hope it doesn't kill the tree. The colors look so beautiful to me. I guess if we get a good strong wind, it will blow the leaves off. The wagon wheel was already sitting against it when I bought this place. I think it looks perfect here. 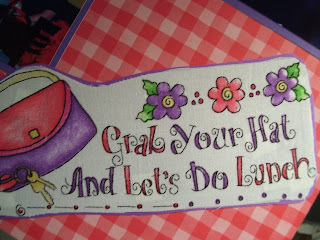 This is another one of our Red Hat Lunches. We had a fun time. We had lunch at a little place in the mall called Broma's Deli. They make the best stuffed spuds. I had a baked potato with grilled chicken and bacon topped with cheddar cheese. It was delicious! The deli was so crowded that day. Everyone kept looking at us and I'm sure some of them wondered who we were and what we were doing! 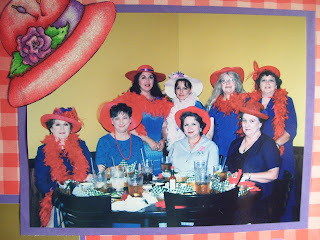 I was the only 'pink hatter' that showed up. After lunch, I had to ditch the hat and walk down to where I work. That is one reason that we had our lunch in the mall because I had to work that day. Boo Hoo!! I didn't get to go shopping with the other ladies like we usually do. Oh well...I don't really like shopping in the mall anyway. Now show me a thrift store or Hudson's or Dirt Cheap and I can shop for hours! I'm serious! I love to dig through everything and find little treasures! It's like therapy to me! Retail therapy! 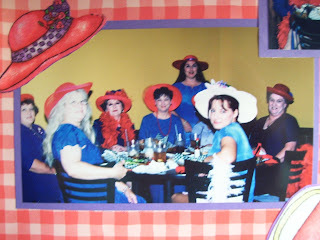 This was one of our Red Hatter lunches. 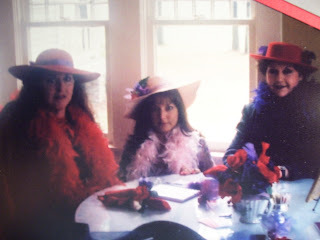 Me and Aunt Jenny and Aunt Ann. 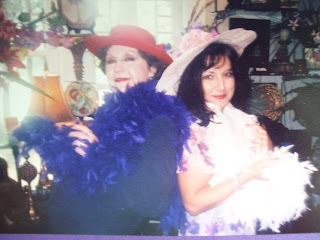 We were at a little place called The Magnolia House and Russian Tea Room. It is a very sweet little tea-room and also has a gift-shop. We always have fun at our tea-parties. We get to catch up on each other's lives and make future plans for our next lunch date. 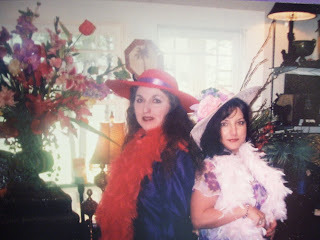 We dress up with our hats and boas and have a blast! Other people sometimes look at us strange...but that is o.k...we don't mind. We just enjoy life and girls just wanna have fun! These pictures are of me and my little sister (my only sister) with our baby boys. We had them 3 weeks apart. I think that they were around 2 years old here. We were at our friend Bridget's wedding reception. Me, Garrett, Melinda, and Chase. I always call him 'baby Chase' because my step-son's name is also Chase. This is one of my favorite pictures of me and Garrett. 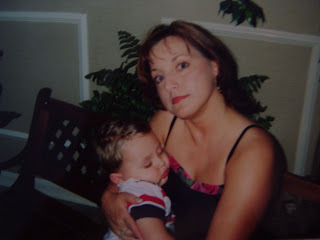 He was so tired...he fell sound asleep in my arms. This is me, my mom, sister, and her little girl, Whitney. We had a really good time at the reception. 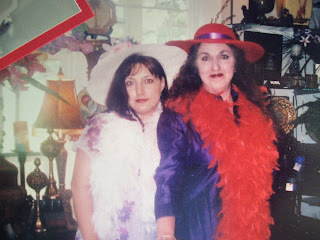 Melinda and Whitney were both in the wedding. 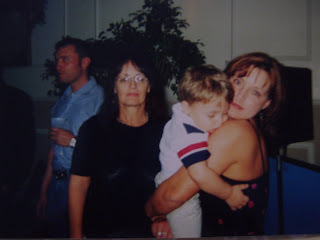 Mom, me and Garrett. My little man was so tired. He was very heavy too. It's hard to believe that he is 7 years old now. Time has really flown by fast. 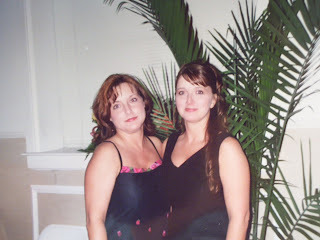 Me and my sister, Melinda. She was a bridesmaid in the wedding. Wasn't she so pretty? 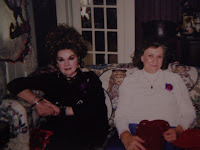 I was going through some old pictures and I ran across these from a Halloween tea-party that we had at my Aunt Jenny's house about 3 or 4 years ago. We had so much fun! 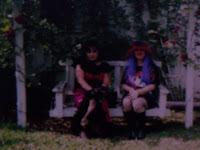 The photos are blurry...sorry... Me and Aunt Jenny...she was a good,sweet,witch and I was a saloon girl. 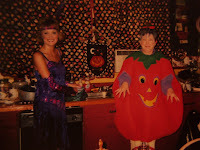 This is my Aunt Ann dressed as a punk rocker! The other lady was a porcelain doll. 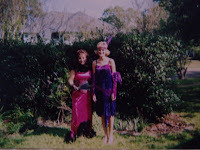 My friend Missy as a flapper-girl and the other lady a big happy pumpkin! Me in front of one of Aunt Jenny's china cabinets. I even love china at Halloween! We really had a fantastic time. We had lots of delicious food. I made a 3 layer chocolate,pumpkin,cheesecake. We don't normally celebrate Halloween...it just gave us another excuse to have a tea-party and to dress up. 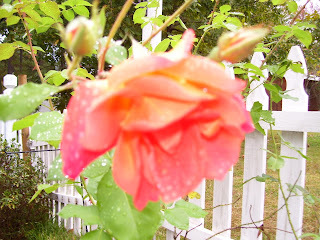 Just wanted to post a few more pictures of my roses. 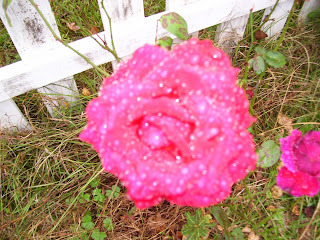 This was one morning last week after it had rained. They are still blooming so pretty. 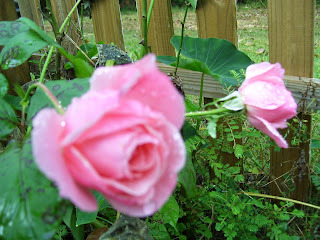 This was my first year to have my rose garden. I'm very happy that they did so well. I bet next year they will be even prettier. I want to plant a few more...maybe some yellow ones and some white ones. 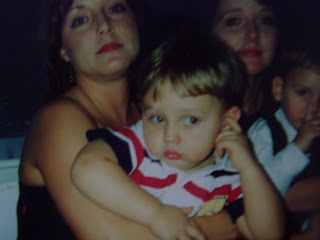 This is my little man when he was around 2 years old. Doesn't he look handsome all dressed up like in the 'old' days? 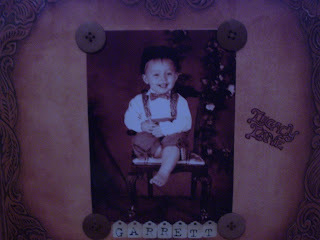 The photographer furnished the outfit but they didn't have any shoes to fit him! I told them that was okay because my granny told me that they didn't always wear shoes back then. They would usually get one pair a year, and that was for when school started and when the weather got cold. This was a page taken out of my scrapbook. Speaking of scrapbooks, I went to our Hudson Salvage Store the other day and found so much neat scrapbook stuff. I had to stock up! 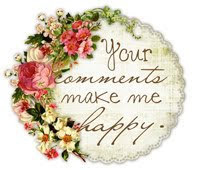 (Like I really needed more!) Garrett helped me pick out several packs of stickers and papers. 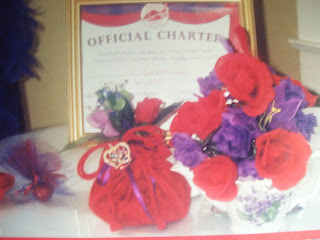 We had a ball going through all of it! I need to do a few pages soon. I haven't done any in a while. I made each one of my children a scrapbook of their own. 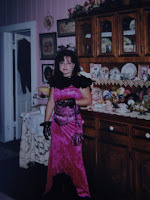 I also have one of just tea parties that I have been to. 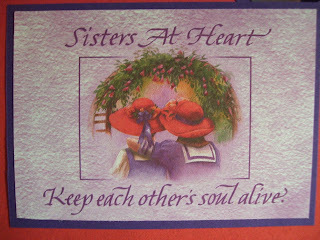 I will post pictures of some tea party pictures soon. 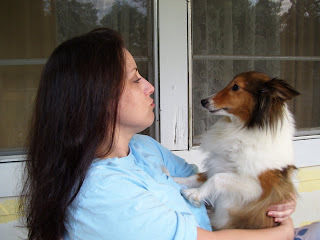 This is me and my Sassy girl. 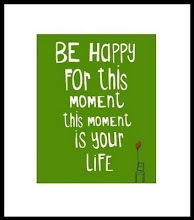 I was outside on my litttle porch drinking my morning coffee and listening to the birds sing. She is such a baby! She wanted me to hold her. She turned 11 years old in September. Can you just see how much we love each other by these pictures? 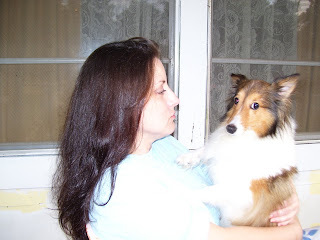 I had her doggie mama for 9 years before she passed away. That just broke my heart. Her name was "Classie". Sassy looks a lot like her mama...just a little bigger. 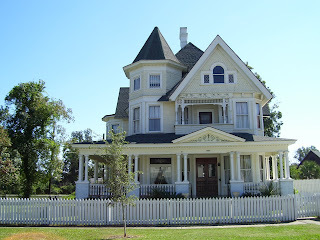 Here is another house that I did a drive-by picture of one day. It was located in Hattiesburg,Ms. I can just image what it looks like on the inside! It is just so beautiful! I could just see myself sitting on the little balcony up top reading a book. I bet that room that leads to the balcony is the master bedroom. Isn't it fun to dream? 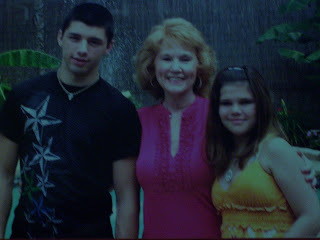 This is Cole and his 'granny' and his sister Taylor, this past summer. He loves to go to his grandparents' house. He likes to help them with their flower beds,etc. He gets to see Taylor usually once a year. Taylor and his other sister Hillary, live in Colorado. We have always tried to keep them close.